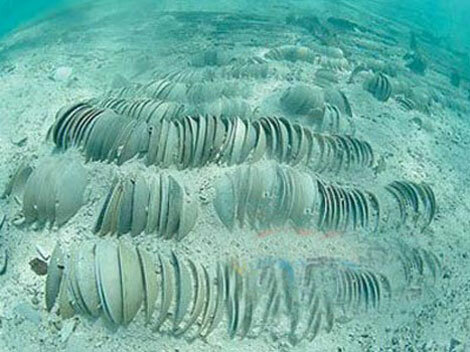 Now some progress on China's large-scale underwater archaeological mission. A team of archaeologists set off last month to excavate a shipwreck in the Xisha archipelago in the South China Sea. And they've already made some remarkable discovery. A team of Chinese archaeologists embarked on one of the country's largest underwater surveys in mid-April, in the Xisha Islands in the South China Sea. The 25 underwater archaeologists are equipped with a 900-ton archaeological vessel and four auxiliary vessels. The survey is focused on Yongle Atoll, which is located to the west of Xisha Islands. And the crew has found a substantial amount of stone building material and carvings at the site. These artifacts contain a wealth of historical information and valuable proof of the ancient Maritime Silk Route. This was a maritime route that connected China with other regions of the world for trade and cultural exchanges.